The Kings Legend sat down with Kayte Christensen-Hunter to discuss his legacy on the court and now in the front office. “It was definitely at that time, the happiest day of my life.” Peja Stojakovic reminisces. In the 1996 NBA Draft, the 6'9 Serbian native was the first round 14th overall pick acquired by the Sacramento Kings. While Peja is still remembered for being a 3-point sharpshooter, it didn't start out that way. Peja only got better from there, and him and his teammates went on to form one the most legendary Kings teams within the franchise. Vlade Divac, Doug Christie and Bobby Jackson are all key members of that legendary squad, and Peja claims that their bond hasn’t changed since they were on the hardwood together. “We have so much love, respect and trust for each other” says Peja. The unwavering support was seen there when all of his former teammates surrounded him, as the Kings retired No. 16’s jersey in 2014. “It’s very humbling feeling. I always think about the team though… it wasn’t just a celebration of my accomplishments. I think of all of the great years we had as a team and how close we were of achieving that goal of winning the championship” says Stojakovic. 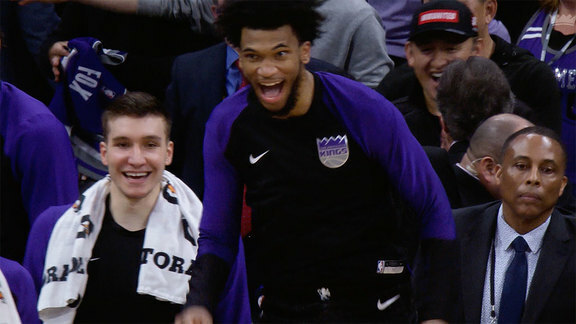 Switching gears to the up-and-coming young Kings, Stojakovic is proud of the new squad. Catch the full interview with Peja and Kayte Christensen-Hunter on Kings Central, here.